Combining the right technology with a Dimensional Management Lifecycle will increase the value of 3D CAD Models through greater tolerance analysis, design collaboration, and improved product. Time to create 2D drawings can be reduced significantly and if suppliers are fully integrated, drawings can be eliminated in favor of 3D visualization of design and manufacturing information. In addition, the 3D GD&T can be easily used for tolerance stack-up analysis from feature to feature in a part, or part to part in an assembly. For inspection, the same 3D GD&T can be leveraged for inspection planning and reporting. Finally, the information is reliably up to date as it is associated with the CAD model eliminating discrepancies between CAD models and drawings. Figure 1: 3D GD&T in a Lifecycle Management Process Using Products from UGS Corp. Readers should be, if not already, aware of the 3D Digital Product Definition Practices standard ASME Y14.41-2003. This standard demonstrates the cultural move to leveraging 3D CAD technology, specifically 3D GD&T annotation, to lean out product definition documentation. The use of 3D GD&T and product manufacturing information (PMI) results in significant reduction in time by eliminating the non-value added replication of information on drawings and provides greater clarity of design. For example, identifying datum features on drawings normally requires several duplications of a datum feature symbol in numerous views. The reason for the numerous duplications is for clarity and with the common minimum of three datum features per part; the clarification effort can lead to as many as fourteen and sometimes more duplications of a single symbol. This of course is time consuming for the draftsperson and often still does not clarify the datum as it is related to whatever feature shown in whatever view. Another example is basic dimensioning. If specifying GD&T specifications like tolerance of position, the drawing standard specifies that the basic dimensions must be shown. This can be a considerable number of added dimensions to a drawing requiring an exceptional amount of time to produce a drawing. Also, populating the drawing with all the basic dimensions adds to the clutter of dimensioning on the drawing. The interpretation of drawings with the various 2D views (details & sections) and the shear clutter of dimensions, notes, and symbols can be very time consuming and mistakes are made. Figure 2: An example of embedded 3D GD&T in UGS NX4 System. The same GD&T is used in 3D Tolerance Analysis with TSV and VisVSA. Note the highlight of Datum F per user query. However, with 3D GD&T, basic dimensions are not required nor are the other features that can fall under the realm of a title block tolerance specification. 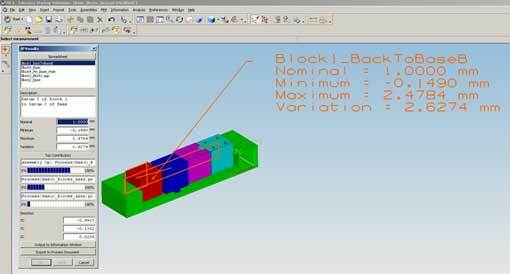 Instead, only the tolerance specifications are required since the CAD model is the "basic" definition. 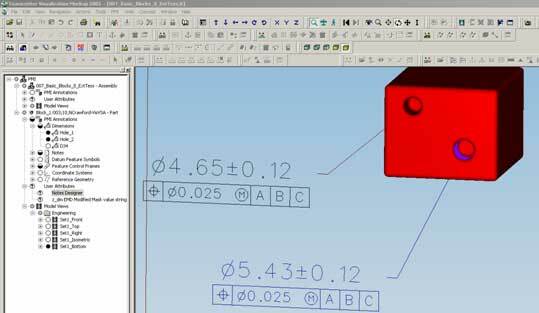 A single datum symbol clearly defines the datum feature that is visually highlighted on the 3D model. As for detail and section views, normally shown in wireframe on a drawing, any decent 3D viewer of a model can easily zoom in on details and dynamically section a part or assembly model. Thus, providing an unlimited number of views instead of the limited details and sections on a drawing that a draftsperson assumes will be enough for someone else to fully interpret the design. As for clutter, a viewer can filter out the PMI to display only what a consumer wants to see. For example, during a review with a supplier, it is easy to turn off all dimensions except for the Datum features so that understanding and agreement on the datum features can be easily reached. What are the metrics? Each industry has varying levels of complexity. So, to find the metrics related to 3D GD&T versus drawings, look for the number of changes; drawing changes and tooling changes. Often changes to a drawing require added dimensions left off and/or adding additional detail and section views to more fully document or understand the design. These changes occur not only while still in the development stage but during the production of a product. Depending on the regulatory authority, a drawing change, besides the expense of the change request documentation, can delay an assembly line adding very significant expense to the change. Then there is the common issue where the drawing has a change, but if the change is a dimension value (product design) the CAD models are often not kept up to date. However, in many manufacturing processes today, the tooling or parts are manufactured using the 3D solid model. There in lies another key metric; tooling changes. During development tooling changes will happen, but many tooling changes occur because of drawings that do not accurately reflect the 3D model. The cost in pure tooling dollars is significant enough but delays in producing the product can be much higher. When using 3D GD&T, a change occurs to the model assuring the model is up to date. Another key efficiency is that solid models will have the details, fillets and draft, with less time spent on producing a drawing. Adding section or detail views is all but eliminated since the any section or detail is made available using 3D model viewers, and virtually no dimension is missing since any measurement can be made off the "basic" 3D model. Is efficiency in dimensioning drawings being recognized? The hole concept of "limited dimensioned" drawings is about efficiency to produce a drawing, be able to read through the clutter to perhaps understand the design and what features are important. In 3D GD&T, there is no clutter and 3D visual collaboration of parts and assemblies is already accepted as better communication tool to understand a design. As for determining the "important features", a good tolerance analysis is in order. Using the right tools, the 3D GD&T can be used down stream in 3D tolerance analysis early on in concept development through production release. For example, if embedded 3D GD&T is applied using the UGS NX4 cad system, early and fast tolerance analysis can be used within the system using the Tolerance Stack-up Validation module (TSV). TSV has the added benefit of checking the GD&T for validity according to the ASME Y14.5M- 1994 standard. How many drawing changes occur, or worse should occur, because of illegal specifications used by associates not truly versed in GD&T? Using a good GD&T checker will improve associates skills in applying valid tolerance specifications. Why care about quick and easy tolerance analysis in concept design? Normally concept design includes multiple concepts and tolerance sensitivity to function and manufacturing can help with determining which concept is really best for full production development. Tolerance analysis of part features and assemblies can be related to CTQs and manufacturability of a design. Choosing the right concept early is critical to the cost and success of the product. Once a concept is chosen and a detail design phase is started, the use of 3D GD&T, again in a tool like the UGS NX4 system, can be directly imported into the more powerful tolerance analysis tool, VisVSA. VisVSA models can be created from sketches on a napkin, much less a well detailed time consuming drawing. However, if 3D GD&T is used in an NX4 assembly, a detailed VisVSA model can be conservatively created in less then half the time. This allows for more time, early on in design, to study where to budget tolerances for greater manufacturing capability while maintaining CTQ requirements and ultimately more robust design. The capabilities of VisVSA are extensive and go beyond the intent of this article, but it is worth mentioning that as successful product is delivered to market using VisVSA analysis, the information is easily reused. VisVSA has a tolerance library capability that can cascade down to the machine producing the part. Therefore, VisVSA enables reuse of real knowledge to help consistently produce quality products while maximizing capability and reducing cost of goods (COGS). In addition to tolerance libraries, VisVSA is CAD neutral, which is why a model can be created from a napkin sketch, so the VisVSA model can be reused on similar part or complete product designs. Reuse and updates are easy because VisVSA elements are easily mapped to new product features so that consistent tolerance values based on known manufacturing and inspection capabilities. What are the metrics? Tolerance analysis is typically done near the end of the detail design phase and is realistically non-value added. It is common that the tolerance analysis using hand calculations, spreadsheets, or some other limited 2D application is either dismissed as not accurate (a reasonable assumption for hand calculations, spreadsheets, etc.) or otherwise causes a change in some dimensional values on the product that may or may not be correct. Is the change the best change? Will the change cause a tooling change? If so, what will be the "delay"? After all, at the end of a detail design, being first to market becomes critical path. How many drawing changes are made only because process capability studies indicate low capability? I know, I’ve been doing this for over 25 years and tolerance changes are made to drawings (the product) based on capability studies using production tooling; to late to change the tool or the design. And because the tolerance analysis is often to complex in many applications or does not even exist, a rationale is written for the deviation or design change based on functional testing. What does additional functional testing and the related documentation cost, especially at the end of a detail design or production phase? Another critical metric is Time to Volume. Certainly there is a difference to produce a product at low volume high cost versus reaching full volume at reduced costs. Time to Volume issues can often be directly related to dimensional control. And when tolerance control issues develop in production, it is a common issue that production associates do not have the sufficient design intent transfer to make accurate determinations for either tolerance changes or design changes that will enable greater manufacturing and assembly capability while maintaining product functional quality. Figure 5: VisVSA can analyze multiple measurements simultaniously with multiple assembly scenarios to directly compare outputs with input combinations. Contributor reports identify the possible change critical features so that manufacturing and inspection constraints can help drive the best scenario to produce a quality product at the best price. A good dimensional management lifecycle provides greater understanding of design intent. Documented design history using related tools such visual revision control and 3D markups are easy to access, review, and understand, providing a much improved design intent transfer across functional groups. 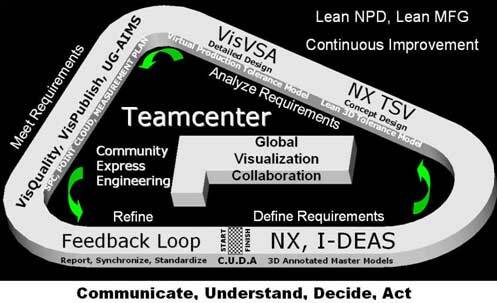 With a well documented 3D tolerance analysis that is directly related to the 3D models and all product information being available within fewer or even a single data file, production associates can understand the design history better and make more informed decisions to deliver a higher quality product at reduced production costs, faster, and move the enterprise into a greater state of continuous improvement. Gains can be made in inspection too. Good measurement planning and actual measurement reporting can be directly related to using good 3D GD&T and 3D tolerance analysis practices. UGS offers several options for leveraging the 3D PMI through inspection. Using VisPublish, VisQuality, and VisVSA, SPC measurement data reports are easy to read and compare to tolerance simulations. And since VisVSA simulations are ever refined based on actual data over time, the important contributors to assembly and function (CTQs) are more reliably identified so that a more efficient and more value added inspection plan can be put in place to assure only quality product is delivered to the customer. This is a far cry from "limited dimension" drawings that fundamentally take a guess at what is important for inspection. There is another product called AIMS which can directly read CAD model 3D GD&T for efficient electronic development of measurement plans and results. The AIMS product already has an interface with the UGS NX CAD system. Product definition has used 2D drawings since the beginning of time and the "same" process has been refined from drawings on cave walls to electronic 2D cad. Although 2D drawings are created faster, the fundamental value of 2D product definition has remained the same; faster but not better. When 3D CAD models were used early on there was considerable debate over the "value" of using 3D. The CAD applications continued to enhance 3D models to the solid model format and the debates continued. Why? Because how to use the model cross functionally had to be developed and accepted. Today, manufacturing makes extensive use of the 3D Solid Models from rapid prototyping to production parts with huge savings in time. Non-contact point cloud inspection and reverse engineering also leverages solid models. Now there are tools using 3D GD&T that will expand upon the value of solid models and ultimately enable new innovative processes, like 3D tolerance analysis, in dimensional management lifecycles to help achieve the corporate objectives of better, faster, and cheaper. Hey there jetero. Your sentiments are echoed by many. However, if your company or those with which you are associated do not embrace model-based definition and eschew the old techniques that include paper drawings, you will be left behind. This is true in aerospace manufacturing even more than any other industry. I am shocked that you are still getting work such as a leading edge rib with the product defined “the old fashioned way.” I am involved in close cooperation with Boeing, particularly for ramp-up on the new 787 aircraft production both for aircraft parts and tooling. They are not providing product definition via any other means besides the “digital thread”, now the norm. I have also just gotten back from visits with Airbus and Lockheed Martin where the plan to move to fully model-based definition is well on the way. One thing you might want to consider when dismissing the importance of MBD for aircraft design and manufacture, is the history of discrepancies between drawings, CAD model, and other defining elements such as mylars and hard-tooled master models. There are many efficiencies to be realized with this approach, the least of which is the cost of paper. Then there are quality and safety issues. If your washing machine breaks down, so what. If your aircraft has a failure because the drawing did not match the CAD model, and the safety of that component depended on the digital definition, you can’t pull the airplane over to the nearest cloud and park it. Well I have played with Adobe 3D and now own a liecence of SolidWorks. So when I have more experience with SolidWorks 3D I'll post my thoughts. Question. What is the approach used in getting companies on buy into this technology? What does the layout(steps) look like to convince companies to invest? There are solutions such as Verisurf software that import the GD&T from Unigraphics and Catia into a CAM system such as Mastercam, and provide a metrology interface with digital inspection devices such as CMMs, that utilize the unique GD&T for measurement, analysis and reporting. As the data are available in the CAM system, manufacturing, quality control and vendors have all of the information they need to manufacture the product without needing drawings. I don't know about other software, but Verisurf is fully 14.41 compliant. It is also AIMS (mentioned by one of the respondants) enabled. It is a shame that some continue to live in the past and resist moving towards full model-based definition. I have experienced numerous situations where engineers changed design simply to make the part or assembly dimensionable for paper drawings, when they could have designed, manufactured, and inspected the parts digitally and would have been able to go with the design they actually wanted. I was rather amazed at the short-sightness of this article. Handling GD&T as an annotation problem is not an effective solution. GD&T must be model based and defined within the CAD model using a structured GD&T database for features, datum reference frames and tolerances. 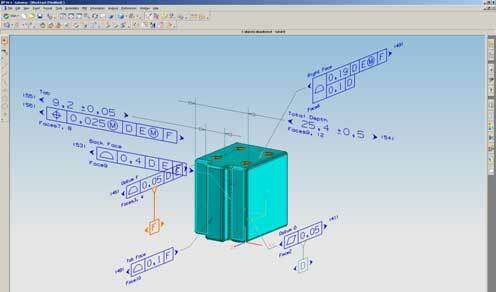 Many CAD systems treat it as simply annotation. The problem is, downstream applications (like inspection) then need to interpret low level annotation and reconstruct the GD&T model. This is poor practice. What really surprises me here is UG (the article is all about UG products) does not even mention their best tool to do this job - Tecnomatix products. 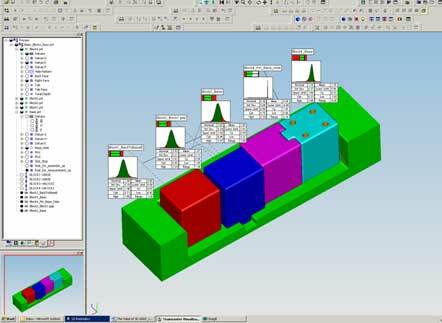 Tecnomatix has a complete model based solution for GD&T including modeling, analysus, inspection, measurement and reporting. Article provides a good overview of data needed to manage a product's dimensions over the life cycle. The comments about datum identification and multiple references in numerous drawings is dead on accurate; this has been the root of many headaches. The focus on UGS systems only limits the usefulness of the article and can give the impression of an extended advertisement. It would be of interest to know of other packages that can do the same or similar things. Some of the grammar should be cleaned up to make it more readable. There are several instances of the wrong word being used (e.g., 'to' instead of 'too') which requires rereading the sentance (sometimes several times) to understand the thought being conveyed. On the balance, a useful article. Some additional work would make it more readable (and useful).